Summary: Three girls are about to discover the meaning of city love. From bestselling YA romance author Susane Colasanti! 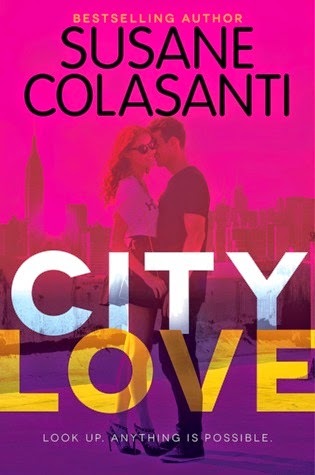 My Thoughts: City Love was another pretty neat book by Colasanti. I always enjoy her books and I love when a new one is announced. We are introduced to three different girls. Sadie, Darcy, and Rosanna. And the chapters flip back and forth between different perspectives. Usually this does not work for me, but with City Love I had an easy time reading and knowing whose life I was reading about. My favorite girl was probably Rosanna. She was so real and down to earth. Next, I liked Sadie. I liked Darcy but I never really connected with her very well. Each girl is navigating living in New York. They have their jobs, their love lives, and getting ready for college. As for the romance aspects, I really liked them all. I think my favorite was probably Austin. He seemed so right for Sadie, and they had so much in common until things got interesting towards the end. I also liked the guy Rosanna was seeing, D.
The first part of this was a big slow even though it flowed nicely together. I never felt the shift between girls difficult to change perspectives. Of course, the wrapping up of the story towards the end was the best part. I wanted to know more, and come to find out there is going to be another book, so that is awesome! Overall: I really liked the plot and the girls. I also loved all the New York references. I've never been there but I've heard of some of the things so reading about them was awesome! I loved the little things thrown throughout the story! And the ending, I need the next one now! My mouth dropped open on Sadie’s story! OMG! Cover: Love it! I’m a sucker for the books that show a girl/guy on the front! Very cute!